I grew up eating cheesecake. Well.. really, what I *thought* was cheesecake. It was Jell-O No Bake Cheesecake, which does have it’s place in the world of quick/instant desserts. But it isn’t really cheesecake. Living in New York, there is absolutely no possibility of getting around eating numerous types of cheesecake — New York Style, Italian Style, French — creamy, gritty, sweet, savory. As is usual for recipes, there are so many increidbly good variations, you just have to find one that suits your fancy. The version here is somewhat light, not overly dense and incredibly creamy. I serve it with a light raspberry sauce over top, but choose your favorite topping. As is with most custards, in my opinion, this will taste even better after being refrigerated overnight. It ripens, as it were. Hey..it’s cheese, after all. Before you start this recipe, please bring the cheese, eggs & sour cream up to room temp. I let them sit on the counter for about 1 hour or so. Heat the oven to 350 F (175 C). Using shortening or butter, grease the 9 inch springform pan. Put a pan of hot water into the oven. I usually just use a 2 quart sauce pan, placed in the very back of the oven, filled with hot water. Next….Melt the butter, and then in a small bowl, mix it until it’s combined well. Dump this into the middle of your springform pan, and spread evenly. Press the mixture with the bottom of a spoon, packing the cracker mix down. If you like, press a bit of the cracker up the sides a bit. In a large mixing bowl, mix the cream cheese, sugar and milk together until smooth. Add in the eggs one at a time, incorporating each egg well into the mix. Add in the sour cream, and vanilla. Lastly, add in the flour. Mix well, scraping the bottom and sides of the bowl to get everything well incorporated. Pour the mix into the springform pan, and allow it to sit on the counter for about 5 minutes, until all the bubbles have risen to the top. Put the cake directly into the oven to bake. Put the cake pan into a waterbath, and bake. (If you are using a springform pan, wrap the exterior of the pan in a few layers of foil, to keep the water out of the cake, and the cake in the pan). Put the cake directly into the oven to bake, with a pan of water on a lower rack. I will admit that I do not always use a water bath, nor put a pan of water in the oven at all. I just put it to the oven. 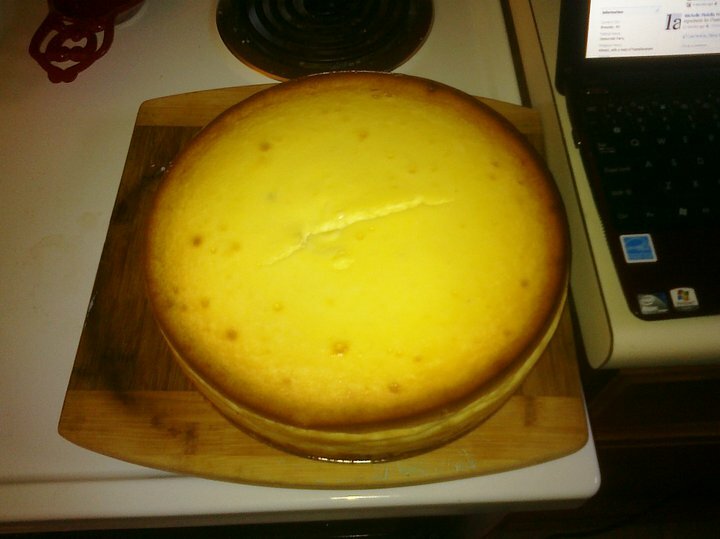 However, because this “cake” is really a custard, it will have more of a tendency to crack, and the water bath (as well as the small bit of flour in the cake), will help to keep that from happening. I have always put a pan of water on a lower rack while the cake baked. Your choice. So.. choose how you would like to bake this… and then do so for 1 hour at 350F. Once the hour is up, turn off the oven and let the cake cool there, with the door closed, for 5-6 hours. The better the cake cools, the more evenly it cools, the less cracking will happen. Keep refrigerated for up to a week. Or, cut into slices, and freeze for up to a month. This entry was posted in Cheese, Christmas, Desserts, holiday, Thanksgiving and tagged Cheese, Christmas, Desserts, holiday, Thanksgiving. Bookmark the permalink.